Automotive braking is, as we all know, an important factor in performance car building. The forward thinkers pay an equal amount of attention to stopping as they do to making their vehicles go fast. But here's a fact that not too many realize: when you step on the brakes, you command a stopping force that's 10 times as powerful as the force that puts the car in motion. Hard to believe isn't it? No wonder the performance brake market has been vying for and finally receiving our attention. But now that they've educated us in the importance of quality components, it's now time to pay attention to the fluid that activates and allows these components to work. It only makes sense that after you've spent big bucks and a lot of time upgrading your vehicle, the completion of your job must go beyond adding just any old fluid into the system. It's extremely important to always use a high quality fluid. Let's face it, that quart of Elmo's Wonder Brake Fluid and Windshield Washer Solvent combo you picked up at the swap meet may end up as the only thing between the ball of your foot and a brick wall. So, let's at least pay a fraction of the attention spent on choosing components on choosing brake fluid. The following information should help you better understand the differences between various types of fluids. Brake fluid must function through heat, cold, and all the variations of temperatures affecting all brake systems. In other words, brake fluid must be and must remain viscous (fluid) and resistant to severe conditions. It must also absorb water without having an affinity for doing so. Brake fluid must be pure and contain no contaminants, which will have a harmful effect on rubber components. It also should serve as a lubricant for the moving parts in a brake system and be able to withstand time and service--in other words, its boiling point and chemical properties must remain stable. One more important factor is that brake fluid should not cause an electrolytic action that will decompose or degrade metal brake parts. These factors are taken into consideration by the Department of Transportation, National Highway Safety Administration in Federal Motor Vehicle Safety Standard 116. FMVSS116-classified fluids fall into four categories: DOT 3, DOT 4, and DOT 5 and now DOT 5.1. DOT 3 meets their minimum specifications and was used in 90% of US made vehicles in 2007. DOT 4, 5 and DOT 5.1 meet more stringent requirements. The purpose of these requirements is "to reduce failures in the hydraulic brake systems of motor vehicles which may occur because of the manufacture or use of improper or contaminated brake fluid." In addition to setting the minimum wet and dry boiling points for all brake fluids, Federal Standard 116 deals with fluid viscosity, temperature and chemical stability, corrosiveness, water tolerance, compatibility (between formulations), and effects on brake system components. It seems logical that if DOT 3 is good enough then DOT 4 must be better. And, if DOT 4 is better, then DOT 5 and DOT 5.1 must be better still. OK then, is that so? NO!!!! Two factors..
1. Some boils (pun!) down to boiling point and the absorption (or not) of water. When brake fluid begins to boil (from the heat that's generated in the system during braking) it forms gas bubbles. As these bubbles collect and grow, they form pockets of gas in the system. And since gas is much easier to compress than fluid, these pockets cause the pedal to easily compress or go soft. This is what as known as a spongy pedal--a condition that causes the heart to race in a racer. 2. The other factor is whether the fluid absorbs water. Moisture always enters the system over time. Non-silicone fluids absorb it, lowering their boiling point. Silicone fluids do not, creating a siutation of two fluids (brake fluid and water) in the system which creates the condition for foaming, mushy brake pedals and rust within the system. The following chart shows the aforementioned FMVSS116 minimum boiling points. These boiling points are the biggest difference in the fluid classifications. You'll notice there are two points for each classification of fluid. The dry boiling point is for fresh fluid that has not yet absorbed moisture. The wet boiling point is for fluid that has been in use (or in an opened container) long enough for it to absorb moisture from the atmosphere. 1.) The brakes won't work due to the vapor bubbles being compressible. 2.) Physical and chemical properties of the brake fluid may change due to the "lighter" components boiling off. The different DOT spec fluids have chemical or formulation differences, as well as boiling point differences. There are (at this point) four commercial formulations for brake fluids; three are glycol-based and the third is silicone-based. 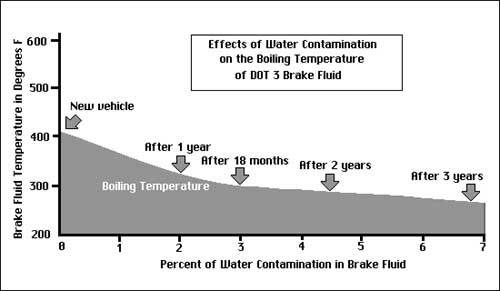 DOT 3 brake fluids are a mixture of polyalkylene glycol ether and other glycols (all start life as ethylene glycol--antifreeze); DOT 4 and DOT 5.1 fluids add borate esters to raise the boiling point. DOT 5 is silicone oil based with additives. The U.S. DOT defines silicone brake fluid as that which consists of no less than 70 percent of adiorgano polysiloxane by weight. Silicone-based fluids are regarded as DOT 5 fluids. They are highly compressible and can give the driver the feeling of a spongy pedal. The higher the brake system temperature, the more the compressibility of the fluid--increasing the feeling of a spongy pedal. Silicone-based fluids are non-hydroscopic, meaning that they will not absorb or mix with water. When water is present in the brake system, it will create a water/fluid/water/fluid situation. Because water boils at approximately 212 degrees F, the ability of the brake system to operate correctly decreases, and the steam created from boiling water adds air to the system. It is important to remember that water may be present in any brake system. Therefore, silicone brake fluid lacks the ability to deal with moisture and will dramatically decrease a brake systems performance. Silicone brake fluid has a number of strengths and drawbacks. 1) It has a high boiling point since it does not absorb water. Therefore, there's no so-called wet boiling point. 4) The viscosity is more stable over the extremes of temperature. 5) With the exception of some formulations used in external boots, silicone brake fluid is compatible with all standard brake components. 1) It's hard to pour without entraining air bubbles--hence an application will generally have a softer, spongier pedal feel. 2) It doesn't absorb water, so any water already in the system accumulates in the lowest point of the system and stays there, causing rust. 3) Glycol fluids begin to compress near their boiling points, whereas silicone fluids begin to compress at around 300-350 degrees Fahrenheit. 4) Additives in the fluid can vaporize at comparatively moderate temperature, increasing the spongy feel. 5) Silicone fluids expand significantly when hot. 6) Silicone fluid is functionally incompatible with systems that have held glycol-based fluids for any length of time, requiring flushing and seal replacement (there are counter opinions on this, which state that the modern silicone formulations are in fact compatible with only a flushing, rather than a complete reseal). The actual DOT specification requires chemical compatibility, so as far as that goes, the two fluids won't cause reactions if used in the same system, but they certainly won't mix, either. 7) It's pretty much incompatible with anti-lock brakes because the silicone fluids tend to be more viscous, which can cause problems with the timing of the pulses that are intended to work with the thinner glycol-base fluid. This sometimes leads to damage of the ABS valving. The rapid pulsing necessary to anti-lock functions tend to cavitate the fluid, as the tiny bubbles collapse and coalesce into larger ones, and then collapse and reform into smaller ones. This tends to counteract the ABS effect and can diminish the actual effective braking. This condition also heats the fluid and can lead to even more sponginess and possible damage to the ABS controller. Thirdly, silicone brake fluid tends to foam when expressed from a small orifice under pressure, reducing its hydraulic effectiveness greatly. 8. Silicone brake fluid compresses more than the polyalkylene glycol ether fluids, making it unadvisable for racing. This is one of the LMA brake fluids. LMA stands for "low moisture activity" and it fulfills this feature well. It has the same boiling points as DOT 4. It is DOT 3 and DOT 4 compatible. DOT 5.1 is another polyalkylene glycol ether and borate ester combination. However, in this case, the mixture can sustain even higher heats than DOT 5 without a mushy feeling. It is also compatible with DOT 3 and DOT 4 brake fluids. It can be bought at NAPA under Part #51032 for 32ozs and Part #51012 for 12ozs. There are other more effective fluids, Ford Heavy Duty DOT 3, ATE Super Blue Racing, ATE TYP 200, Motul Racing 600, Castrol SRF, Performance Friction, etc but the price is not justified for a road car. N.B. There are many racing fluids available..bringing the price and the quality of DOT 3 and DOT 4 far beyond the standard fluids. DOT 3 brake fluid is the "conventional" brake fluid used in most vehicles. It is inexpensive, and available at most gas stations, department stores, and any auto parts store. It is completely compatible with DOT 4 and DOT 5.1. It eats paint and skin (wash it off ASAP). It absorbs water very readily. Accordingly, once a container of DOT 3 has been opened, it should not be stored for periods much longer than a week before use. It is NOT compatible with Dot 5 whatsoever and should never be mixed. A safe switch from DOT 3/DOT 4/DOT 5.1 to DOT 5 requires a complete flush of the braking system and a change of all seals in the hydraulic system. It is available at most auto parts stores, and gas stations and department stores. It does not absorb water as readily as DOT 3 fluid. It has a higher boiling point than DOT 3 fluid, making it more suitable for high performance applications where the brake systems are expected to get hot. It is completely compatible with DOT 3 and DOT 5.1. DOT 5 brake fluid is also known as "silicone" brake fluid. It was designed for the US Army, who has regularly requested permission from Congress to stop using it. It does not eat paint or skin. It has a higher boiling point than DOT 3 and DOT 4. It is compatible with all rubber formulations. It is a good choice for Concours cars which are rarely driven and/or never driven hard. It does NOT mix with DOT3 or DOT 4 or DOT 5.1. Most reported problems with DOT 5 are probably due to some degree of mixing with other fluid types. A residue of the former non-compatible fluid is sufficient to cause serious issues. The best way to convert to DOT 5 is to totally rebuild the hydraulic system. Additionally, the same advice applies if switching from Dot 5 to any of the other fluids. Since DOT 5 does not absorb water, any moisture in the hydraulic system will "puddle" in one place. This can cause localized corrosion in the hydraulics. Careful bleeding is required to get all of the air out of the system. It is hard to you without introducing bubbles and thus results in soft pedal feel. These small bubbles will form large bubbles over time. It may be necessary to do a series of bleeds. DOT 5 is less compressible (often creating a slightly softer pedal). It is not recommended for racing application. It is not recommended by the brake manufacturer, especially for ABS brakes. It is about twice as expensive as DOT 4 fluid. So silicone fluid aerates easily. Harley-Davison, one of the sole current OEM users of silicone fluid, warns buyers to let the fluid sit at least an hour before using it. If shaken on the way home, it will aerate enough to look like a freshly poured soft drink. Silicone fluid is also slightly more compressible than glycol fluid, does not change color to tip the user to its moisture content, and worst of all, neither accepts or disperses moisture, making systems using it more corrosion prone, and requiring much more frequent fluid changes. Silicone brake fluid also lacks glycol fluid's naturally occurring lubricity, making it incompatible with the mechanical valving in some anti-lock braking systems. DOT5.1 is a relatively new brake fluid that is causing no end of confusion amongst mechanics. The DOT could avoided a lot of confusion by giving this new fluid a different designation. The 5.1 designation could lead one to believe that it's a modification of silicone-based DOT 5 brake fluid. Calling it 4.1 or 6 might have been more appropriate since it's a glycol-based fluid like the DOT 3 and 4 types, not silicone-based like DOT 5 fluid. As far as the basic behavior of 5.1 fluids, they are much like "high performance" DOT 4 fluids. It provides superior performance over all the other brake fluids discussed here. It has a higher boiling point, either dry or wet, than DOT 3 or 4 or even DOT 5. In fact, its dry boiling point (about 275 degrees C) is almost as high as racing fluid (about 300 degrees C) and 5.1's wet boiling point (about 175 to 200 degrees C) is naturally much higher than racing's (about 145 C). It is completely compatible with DOT 3 and DOT 4 making an upgrade from either easy.. It is mildly more expensive than DOT3 or DOT4. It is NOT compatible with Dot 5 whatsoever and should NEVER be mixed. A safe switch from DOT 3/DOT 4/DOT 5.1 to DOT 5 or vice versa requires a complete flush of the braking system and a change of all seals in the hydraulic system. The danger is whent you do not know what type of fluid you have in there now. We must ascertain that first and foremost because mixing DOT 5 with anything else is very dangerous. That MUST be checked out first. DOT 5 is not compatible with all other brake fluids and deep sadness can result by mixing, even trace elements, of one with the others. 1. Get a eye dropper and take some fluid from the reservoir. 2. Place it into a clean glass jar and add some clean water to the fluid. 3. Replace the lid and shake it well. 4. Let it stand for a few minutes. 5. If the water and the fluid have mixed thoroughly and cannot be separately identified, then you have regular auto brake fluid. (DOT 3, DOT4, DOT 5.1 or LMA or Castrol Brake Fluid DOT 4. They are all compatible and you can top up with any of the others. 6. If the water and the fluid have not mixed, or have formed floating globs or separate levels then the fluid is DOT 5, incompatible with the others. You can only top up with DOT5.